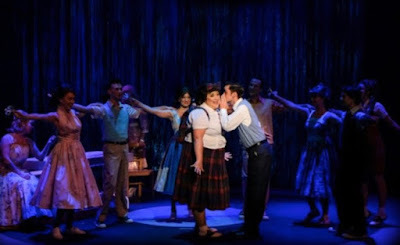 Carol's Theatre Reviews ~ It's Fun To Go Out: SDMT “Hairspray” An Instant Success. SDMT “Hairspray” An Instant Success. Clive Barnes dance and theatre critic for The New York Times was quoted as saying that “Hairspray” was Broadway’s ‘Great Big Gorgeous Hit’. If you’ve never seen it or it’s been too long since you’ve last seen it, now is your big fat opportunity to do so. It’s here in town at the Horton Grand Theatre by way of San Diego Musical Theatre through Sept. 2nd. Winner of eight 2003 Tony Awards including Best Musical and directed by our own Jack O’Brien of Old Globe fame, the Broadway cast starred Marissa Jaret Winokur as Tracy Turnbald and Harvey Fierstein (the King or Queen of drag and the essential Edna Turnbald) as her mother, Edna. Both won Tony’s for their respective roles. For Baby Boomers and younger who may not remember the ‘60’s here are a few dances that thrived then: ‘Stricken Chicken’; ‘The Madison’; The Locomotion’; ‘The Handjive’; ‘The Bug’; ‘The Pony’; ‘The Mashed Potato’ and ‘The Twist’. Words like Afro, Beehive, Extensions, Perm, Pig Tails, Pompadour, Skunking and Teasing were made popular. The Civil Rights Act, Alfred Hitchcock’s “Psycho”, JFK, Bay of Pigs, Peace Core, Cuban Missile Crisis and the death of Marilyn Monroe were a few items that made history in the early 60’s. That we were in for some trying times would be an understatement for years to come. The originators of “Hairspray” were able to incorporate some of these social changes into the musical with out so much as blinking an eye and all done in fun. Would that it were so easily accomplished in real time. 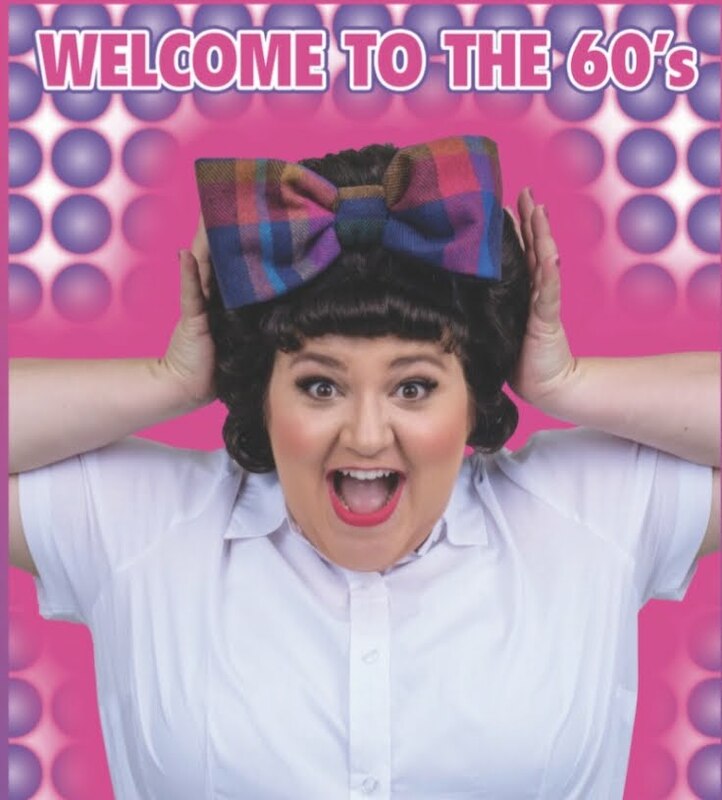 It isn’t every day a musical comedy becomes a hit when the big girl (Bethany Slomka as the quintessential Tracy Turnbald) with the two -tone bouffant teased to hilt gets the hunk. Nickolas Eiter is Link the handsome guy on the show whose almost going steady with the most popular girl in town, Amber Von Tussle (Lauren King Thompson) falls for Tracy in a turn about is fair play. It isn’t every musical where the bigot’s daughter ends up with the ‘black guy’, (in 2018 it would be predictable) or a TV station whose lily-white advertisers don’t see black as a color, becomes integrated. And not everyone’s family in the 60’s was well…that different. In particular Tracy’s parents are as unusual as they come, with John Massey as the soft -spoken Edna trying to look petite and Steve Gunderson as her entrepreneur and husband. They become the adored couple of the show, and are such fun to watch. He/she towers above him and (Edna) is made up to outweigh Wilbur by at least 100 lbs. But on this particular journey all of the above happens. 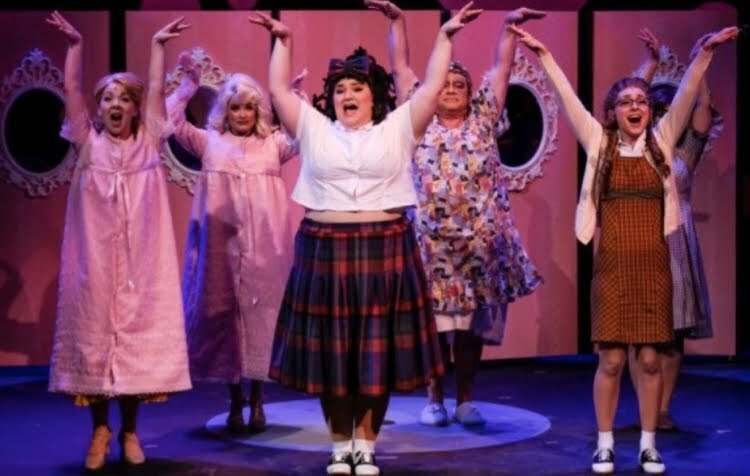 With the magic of musical theatre under J. Scott Lapp’s direction and Don Le Master’s baton, “Hairspray” starts off with a bounce and never once looks back or stops to take a breath. The story line is simple: Tracy Turnbald, an overweight, 15 year old high school teen loves to dance. The popular television show, ‘The Corny Collins Show’, a trendy day -time dance show is having a contest to see who the best dancer is in the city of Baltimore. Tracy wants to be a contestant, but we know the show has a fix in for her rival, Amber Von Tussle (Thompson). Amber’s mother, Velma (Eileen Bowman at her very best) is the honcho who gets to make all the important decisions, including who can or cannot audition, and there is NO way it’s going to be Tracy. Together mother and daughter they are as effective as chopped liver on white bread with mayo. The struggle of ‘Who’s to be or not to be on the show’ continues through two acts with no less than nine scenes of high -octane music, ‘Tight Hold’ Hairspray, and array of some snappy and colorful dancing choreographed by Jill Gorrie. 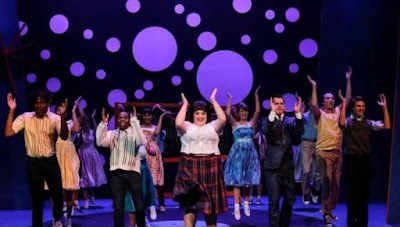 One of the most important social upheavals of the century, integration, was about to happen right in front of our eyes and it all takes place (a la Hollywood and Broadway) in the uplifting and bouncy production of SDMT’s “Hairspray”. The young and extremely energetic cast that shake the house up with such lively numbers as “Welcome to the 60’s”, “Good Morning Baltimore”, “You Can’t Stop The Beat”, “Hairspray”, “Without Love” “Mama I’m a Big Girl Now”, “Tight Hold”, and of course “You’re Timeless To Me” are to be given high grades. They ROCK! Big gal makes good is at the crux of “Hairspray” but one of the most important social upheavals of the century, integration, was about to happen right in front of our eyes and it all takes place (a la Hollywood and Broadway) in the uplifting and bouncy production of San Diego Musical Theatre’s “Hairspray”. SDMT talent also includes Zackary Scott Wolfe as the smooth M.C. Corny Collins; Kenneth Mosley is Seaweed J. Stubbs (a excellent dancer with voice to match) is the handsome boyfriend of color to Tracy’s loony best friend Penny (Emma Nossal is a hoot). Penny’s bigoted mother Prudy (Debra Wanger having a blast as the coo coo Mom) is another prime example of the not so pretty racism that comes out with her blatant bigotry that is still rearing its ugly head today. Eileen Bowman is Velma Von Tussle, the in charge person who gets to make all the decisions about who is in and who is out of the dance show. She’s another bigoted dragonfly who does her best (and she is good at it) to keep the show white bread lily white and without Tracy. She gets her point across in “Velma’s Revenge” and “(The Legend of) Miss Baltimore Crab”. In contrast, Eboni Muse (seen recently in “The Buddy Holly Story”) is terrific as Motormouth Maybell the owner of a Black record shop/hangout belting out “Big Blonde and Beautiful” and “I know Where I’ve Been”. Kudos again to Bethany Slomka, who is recreating the role once again that brought her instant accolades from the entire audience. If anyone doubts that she is having fun as Tracy, think again. She’s loving it. Hats off to Michelle Miles (lighting), Peter Herman (wigs), Kevin Anthenill (sound), Mike Buckley (sets), of course Janet Pitcher for her creative costumes for Edna, Motormouth and Velma. Globe’s “Much Ado” Has Much To Do Going For It.